Revenue in the Juices segment amounts to US$66,408m in 2019. The market is expected to grow annually by 3.6% (CAGR 2019-2023). The market's largest segment is the segment Other Juice, Juice Mixtures & Smoothies with a market volume of US$28,485m in 2019. In global comparison, most revenue is generated in United States (US$12,101m in 2019). In relation to total population figures, per person revenues of US$9.02 are generated in 2019. The average per capita consumption stands at 4.7 L in 2019. This segment consists of all types of bottled fruit and vegetable juices which contain 100% fruit and/or vegetable juice. Fruit nectars with limited fruit content and juice-based soft drinks are not included here. The segment is divided into Orange, Apple, Grapefruit, Grape, Pineapple Juice and a final segment for all other fruit and vegetable juices, including mixes. Prominent producers of fruit juices are Coca-Cola (e.g. Innocent) und PepsiCo (e.g. Tropicana), and Del Monte. Reading Support Revenue in the Juices segment amounts to US$66,408m in 2019. Reading Support The Juices segment is expected to show a revenue growth of 3.9% in 2020. Reading Support The average revenue per person in the market for Juices amounts to US$9.02 in 2019. Reading Support In the market for Juices, volume is expected to amount to 36,809.8 ML by 2023. 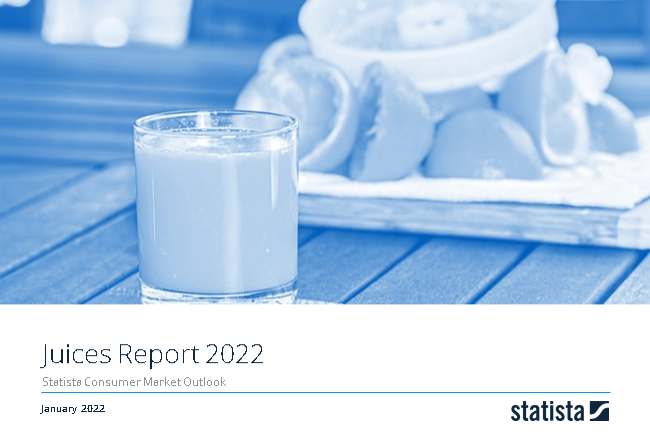 Reading Support The market for Juices is expected to show a volume growth of 1.6% in 2020. Reading Support The average volume per person in the market for Juices amounts to 4.7 L in 2019. Reading Support The average price per unit in the market for Juices amounts to US$1.92 in 2019. Reading Support With a market volume of US$12,101m in 2019, most revenue is generated in United States. Here you can find more studies and statistics about "Juices".